Is there a right-click (context menu) action to "open in new tab in 2nd pane" ? I am brand new to Path Finder. I've searched but did not see this topic covered, but I probably am not using correct terms? I'm afraid there is no such option yet. Path Finder Support Team closed this discussion on 21 Mar, 2019 10:30 PM. There is, however, a hotkey that does just that. You can find it in View -> Browse in next pane (F3). It works only if you already have dual pane browsing enabled. Path Finder Support Team closed this discussion on 21 Mar, 2019 10:57 PM. Thank you Jordan. That's very useful to me, i appreciate your digging further. What I discovered is that, also, it is easy enough to "open in new tab", then manually drag it into the 2nd pane if need be. In the screenshot below, this is my current "best standard", where the key feature is an ICON-ONLY "favorites" vertical column (Column 3)— a modified "Sidebar" eliminating text. This is my primary drag-drop-to palette where I file away stuff I have placed on my Desktop during an everyday browsing session— including downloaded DMGs, PDFs, Google Drive and Google Photos downloads etc, plus assorted web links and screenshots. This handles 90% of the day's incoming new files, with the other 10% coming from photo editing, video editing, text editing files that are in their designated media-type file folders (all of which have custom-icons to more easily identify them at a glance vs having to read a label). Tech Help files from web and Youtube. That icon-based column is now eliminating the need for the feature I initially asked about in this thread— where initially I was using LEFT PANE to be my "drag & drop to" targets for quick-filing. Which meant I was more or less dedicating that Pane to be fixed, in List View. And the Right pane gave me a more granular "cascading" sub-folder access without disrupting my top-level content categories information architecture. For me: LEFT PANE is always "fixed" into LIST VIEW or Icon view — but no sliding columns where I lose visual focus wasting time scrolling horizontally. Typically the Left Pane will be my SOURCE pane, and the right pane is DESTINATION. 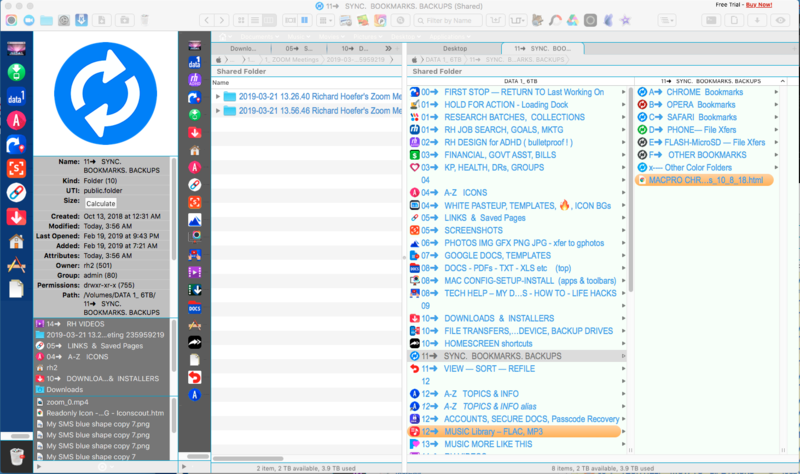 The RIGHT PANE is always in COLUMN VIEW with easy sub-folder viewing. And if I have to use column view to locate a buried source file, I will do it in Pane 2, leaving the Left Pane to be constant. I can then SWAP panes if need be. • ICON COLUMN is the drag-to target for 90% of my incoming files for the day. • LEFT PANE is really just the expansion of icon column, my top-level information design always visible, but almost always my Source for file actions • RIGHT PANE is my Destination actions pane, finding buried stuff, to copy/move from or to. Path Finder Support Team closed this discussion on 22 Mar, 2019 03:39 PM. I will forward your message to our developers as a feature request for consideration so that it could be implemented in one of our future cycles. Path Finder Support Team closed this discussion on 22 Mar, 2019 05:04 PM.